Traveling by train within Thailand is a different and stimulating experience. For this reason it’s a very popular activity both for international tourists and others. The most crowded routes are those between Bangkok and Chiang Mai, and also those that go to the border with Laos, especially for those looking to renew their visas (but not only). A great idea is to book tickets a few days in advance, especially if you’re traveling in particularly crowded periods such as the Thai new year, which falls around mid-April each year, or the Christmas and New Year’s vacations. After choosing your destination, you can buy your tickets by going up to one of the counters found inside the station. Remember to bring a form of identification with you, preferably your passport, because you’ll have to confirm your booking and information on the ticket. You can also reserve tickets by phone, calling the numbers: 1690, 022233672, 022247788, or 022250300. This second option is only for those who are already in Thailand. If however you’re outside of Thailand, the number to call is +6622233762. An excellent alternative is to buy your tickets directly online, on the official site for Thai railways. Once you choose your route and dates, you can proceed to payment and print the tickets right from your home. Besides the official site there are also other platforms that offer the same service:12goasia, Thailand Train Ticket and Asia Discovery. Tickets can be purchased up to two months in advance by going to the station in person, or a month in advance for online sales. Ticket offices are open every day from 8.30 to 16. An important thing to remember is that online tickets are available only for departures that leave from Bangkok or Chiang Mai. There are three classes: first, second and third class. Just as in Europe, in Thailand first class is the one with the most comforts. First class carriages are equipped with more comfortable seats, air conditioning, and bar service. Moreover night trains between Bangkok and Chiang Mai have compartments with two bunk beds inside and a private sink. Second class also has air conditioning and comfortable seats that are less elegant than first class but definitely better than third class. Sleeping berths in second class are also comfortable enough and have compartments for your luggage. For this level of service you can choose between carriages with air conditioning or fans. In third class you’ll find wooden chests (if you’re fortunate enough to find a seat), and not even a hint of air conditioning or fans. There are also four types of trains: regular, fast, express, and special express. The majority of trains are dedicated to the transport of passengers, but there are some that transport both passengers and merchandise. Regular trains are those that only offer third class, while the other three types of trains don’t vary much between each other. They all offer first, second, and third class and have at least one carriage for nighttime trips. Both in first and second class, beds for nighttime journeys can be accessed by taking away the little table between the seats and pulling the seats out to create an actual bed. At the ends of each carriage there are bathrooms and even a shower, though only with cold water. By means of the aforementioned connections, you can also reach bordering countries such as Laos, Cambodia, and even Malaysia, thanks to the famous and luxurious Eastern Orient Express, which for over ten years crosses Singapore, Malaysia, Thailand, and Laos. Categorized as one of the most luxurious trains in the world, the Orient Express gives you the chance to visit four countries in just a few days, for a price starting from 1,800 Euro a ticket. Depending on the suite you choose, you can even get a panorama of 180 degrees. Trips on the Eastern Orient Express can be personalized and change from year to year; for the 2017-2018 season for example, you can do the Bangkok-Singapore route without going through Laos and northern Thailand. If this is your kind of trip, on this site you’ll find lots of information and all the itineraries. Among the most evocative Thai destinations to visit by train is Kanchanaburi. 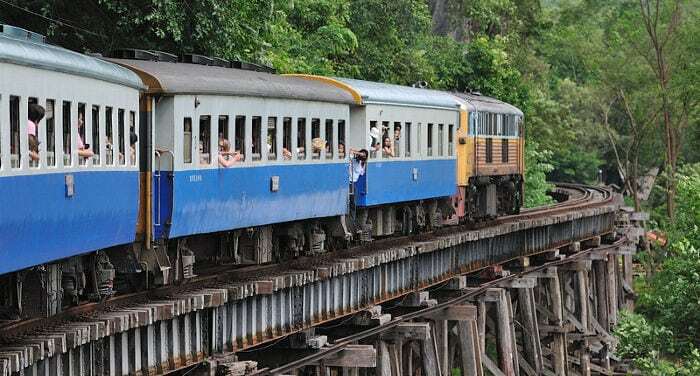 This little town, located 130 kilometers west of Bangkok is sadly famous for the tiger sanctuary regularly visited by tourists from around the world, and today is known also as the “railway of death”. This train route is frequented by both Thai and international tourists. It could be considered one of the biggest attractions of Kanchanaburi Province, together with the Kwai Bridge, built by the Japanese in 1942. The interior region became particularly famous also thanks to the 1952 novel by Pierre Boulle, called “The Bridge on the River Kwai”, and the film of the same name in 1957. Both works are set during the Second World War, when the allies bombed the wooden Kwai Bridge (later rebuilt with steel). The bridge served as a key connection for Japanese troops going from Myanmar to Thailand. The name “railway of death” is instead derived from the high number of people who died during the construction of the bridge itself; mainly Dutch, French, English, and American prisoners. Despite being bombed by the British and partly destroyed during the 50’s, the metal bridge can be visited both on foot and by train. A ticket for this tourist train is 20 THB a person. There’s a trip every 20 minutes, every day from 8 a.m. to 3 p.m.
Options for getting to Kanchanaburi from Bangkok are diverse. If you want a total immersion in traveling by train, I recommend you take a local train. Book tickets a few days in advance, because this is a very popular route and there are only two trains daily that offer this service. Pay attention though to the fact that this train doesn’t leave from Hualamphong station, but rather from Thonburi, a small town on the western part of the river that crosses Bangkok: the Chao Praya. You can get to Thonburi by taxi, and take one of the only two trains of the day, the first at 7.45 in the morning, and the second at 1.35 p.m. (which you’ll also have to take on the return). A ticket costs 100 THB a person for foreigners, and is free for Thais. The second option is to go from Bangkok to Kanchanaburi by bus which leaves from the north station of Morchit, or also Ekkamai. Tickets cost between 120 and 150 THB depending on the station and company, and travel times are around 3 hours. There are lots of attractions to see in Kanchanaburi, and if you’d like a better idea of them I recommend that you visit the city’s official site. Even though Thailand is not a dangerous country, much like the rest of Southeast Asia, I do recommend that you travel with a little common sense. Don’t bring valuable objects with you, or at the very least don’t leave them unattended. If you can get bunks, choose those located midway through the car. The first and last spots are the worst because they’re noisier, especially when there’s a lot of stops. If you are in the last bunks (those closest to the doors) you risk not getting any sleep due to the constant noise of the train, the lights, and the continuous shouts of the service personnel that takes place every time the train restarts. To conclude, I suggest that you bring something to eat and drink. Even though food is served, it is often very expensive by Thai standards, and the majority of times is little more than boxed food that you could find in any 7/11, or food a few days old.